Greater Hyderabad Municipal Corporation of GHMC for short is the municipal body for the city of Greater Hyderabad. It covers one of the largest area under any municipal department after Delhi in India. GHMC which has all areas the erstwhile Municipal Corporation of Hyderabad or MCH had including 10 municipal bodies & 8 panchayats of Ranga Reddy district, 2 municipal bodies of Medak district and 1 municipal body of nalgonda district. GHMC collects tax annually and provides an incentive to tax payers who pay there tax before a pre defined date as declared by GHMC. The incentive is also declared by GHMC. 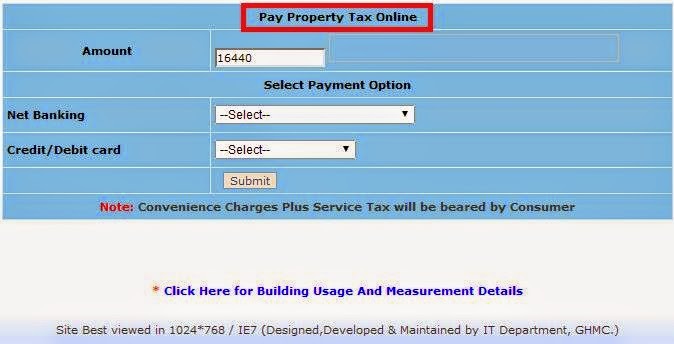 Official website of GHMC is http://www.ghmc.gov.in and you can pay your property tax online GHMC site by following the procedure given below. 1. Know your GHMC Circle: Before you set out to make payment of your Property tax online you need to be aware of your GHMC Circle.Area under GHMC has been divided into 18 circles and 150 wards. 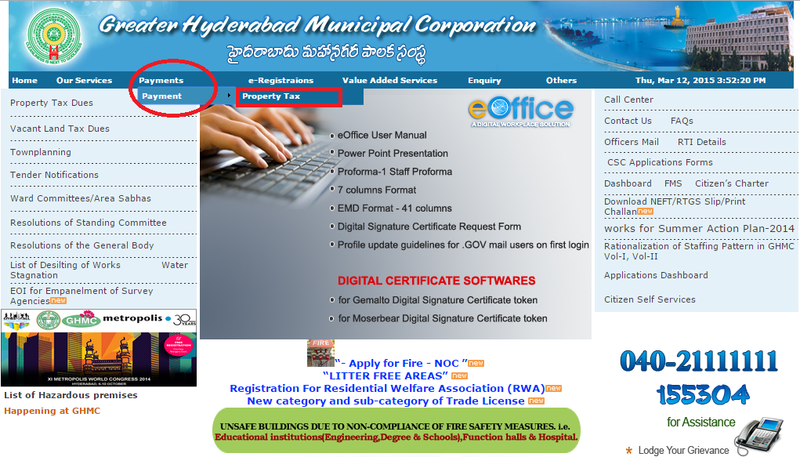 You can obtain this information form this link GHMC Circles or by calling GHMC Helpline number 155304 or in the Property tax notice received by you as shown below. 2. 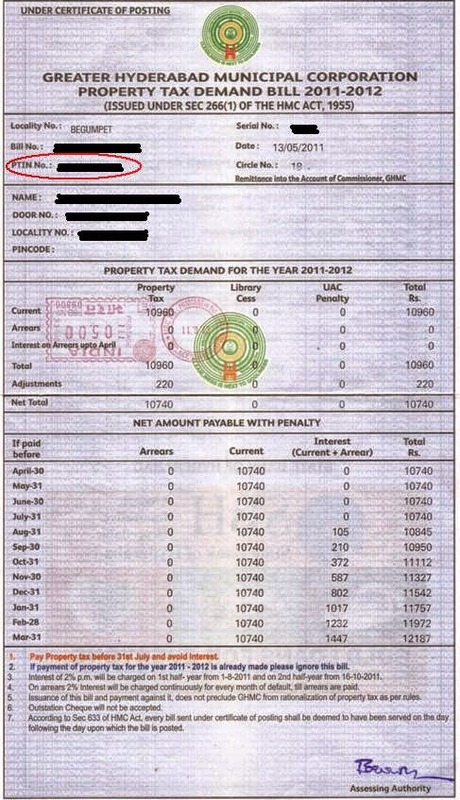 Know your PTIN: PTIN or Property Tax Identification number is a number assigned to you by GHMC. This number identifies your property in the GHMC database. You can find this on your Property Tax Notice as shown below. It is essential that after you have correctly note this number and verify the details like address and name in the GHMC database. Please note that above link is the link at the time of writing this article but is subject to change from time to time depending on changes made by GHMC to its site. 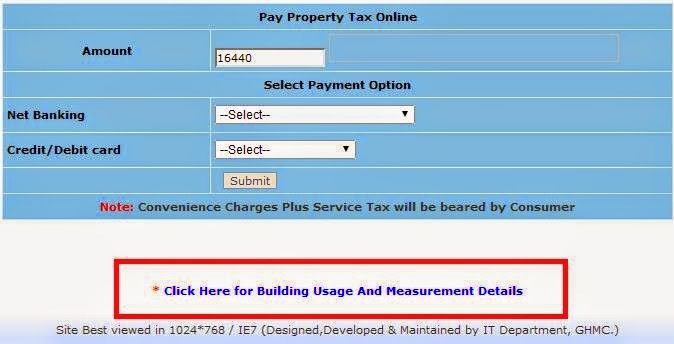 Thus it is recommended that you visit the official site of GHMC and then click the link Payments--> Payment-->Property Tax to get the latest link. 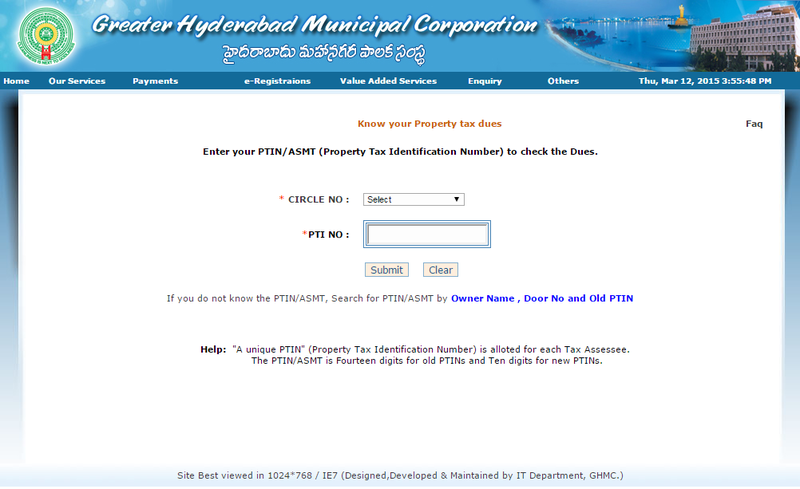 You will then see a page as shown below wherein you have to select your GHMC circle and enter your PTIN number to get the property tax due against your property. After entering your Property Tax Identification Number(PTIN), information regarding your property will be retrieved from the GHMC database as shown below. You can also check the the plinth area of the property by clicking the link at the bottom as shown below. You can make payment either through Netbanking or Credit Card. The payment gateway has been provided by IDBI Bank. Once the payment is made successfully you will be given a transaction number as shown below. Make a note of it future communication with GHMC in case of dispute.